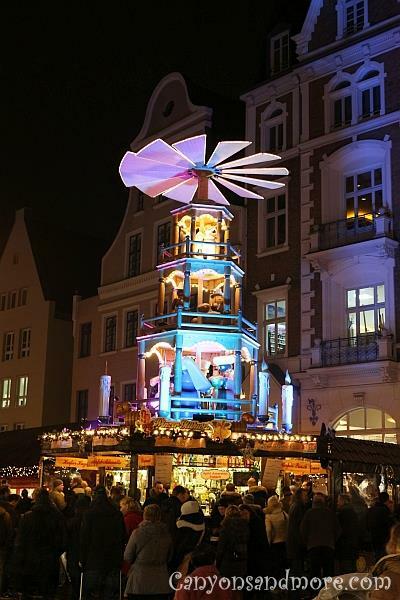 The Christmas markets of Nürnberg, Frankfurt and Stuttgart are well known but the northern of Germany has a few gems of markets itself such as the ones in Hamburg, Lübeck and Rostock. 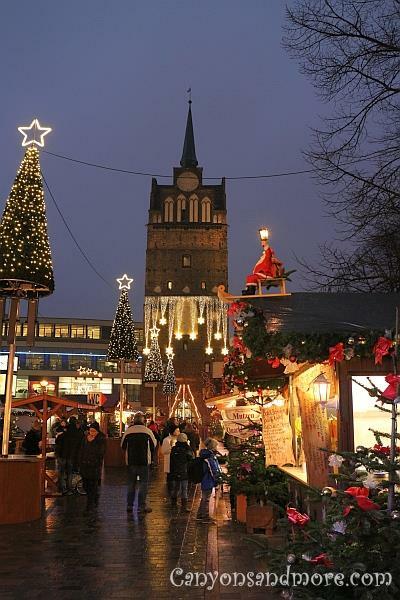 The Rostock Christmas market is also supposingly the largest in the north, too. 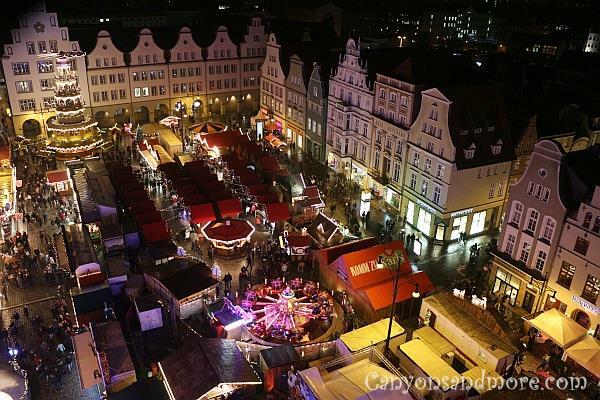 The main Christmas market in Rostock is located at the “Neuer Markt”. The location between historic buildings and the city hall give the market so much charm and beauty and the pyramid gracefully overlooks the market from the background. 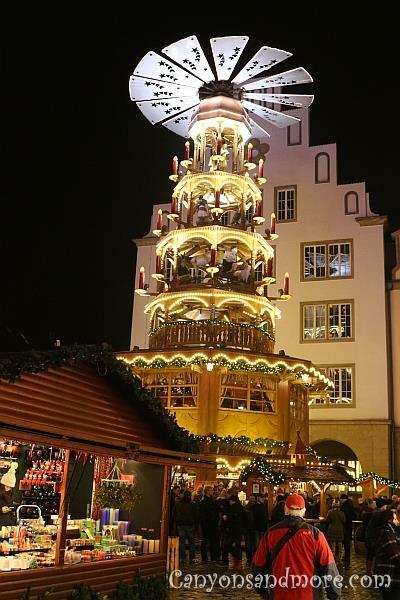 There are many stalls where you can purchase Christmas gifts and several stalls selling food and drink, especially mulled wine is a favorite at any Christmas market. At one end of the market, there are even a few rides for the kids to keep them happy. The large ferris wheel is a big treat for young and old alike. The view from above just cannot be beat. The market is lovely during the day hours because you can enjoy the historic buildings in the background but of course the market looks fantastic at night when all the lighting really adds more beauty to it. 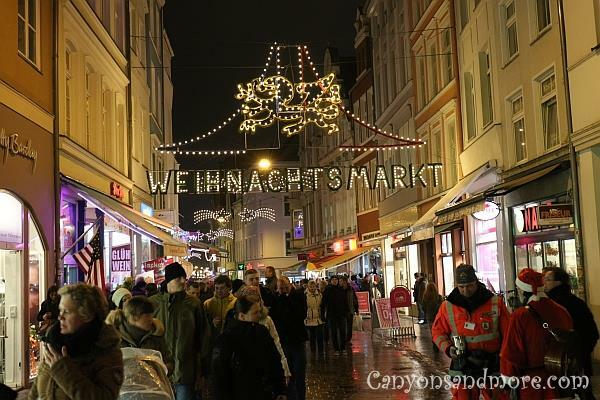 If you go during the week, it is much less crowded during the day but the amount of people increase as the evening hours approach which is already around 4 p.m.
Christmas market stalls extend further into the city once you have visited the main market. You can continue down the pedestrian zone of Kröpeliner Strasse, as well as a few side side streets, and find many more stalls are located down the middle of the street. While heading in the direction of Kröpeliner Tor you will then see signs directing you to the “Klosterhof” off to the left to the historic medieval market. The setting around the historical market is along the town wall and adds a feeling of quaintness to the market. Tents and small wooden houses, as we would picture them from an ancient time, are used and the merchants wear traditional looking middle age clothing to add to the feeling of the market. You can watch some doing various hand crafts and also buy their goods as well. Music and food are also plenty and you can choose to try your luck in shooting a bow or throwing small axes if you like. If you go here before 4 p.m., you can get into the market area for free but afterwards it costs 2 Euros per person (2014). The market is lovely to see and takes you into a different world, if only for a short time. After visiting the historic market, you can head back towards Kröpeliner Strasse and then proceed to Kröpeliner Tor. Beyond that point is yet another market with more rides for the kids and several food and ware stalls. From here you have a beautiful view of the Kröpeliner Tor which is festively lit up as well. The image above shows the market from up above. While at the “Neuer Markt” hop on the ferris wheel. 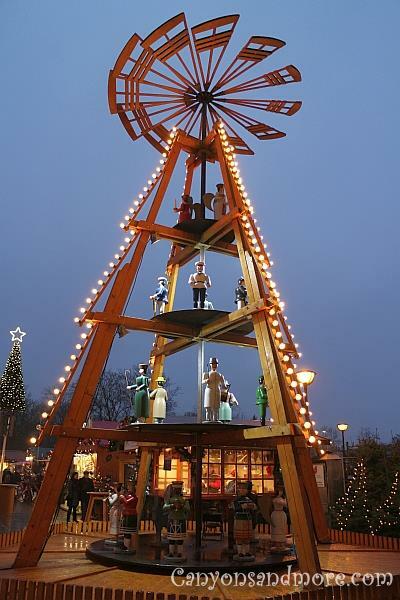 It costs 3.50 Euros (as of 2014) and from the top, you have a lovely view of the main Christmas market from above. The historic buildings surrounding the market give it a lot of flair. During the day, you can also enjoy the setting around the market. The style of the buildings is typical for the northern area of Germany. The Marienkirche in the background adds so much beauty to the market. This pyramid located in the main market area is over 20 meters high. 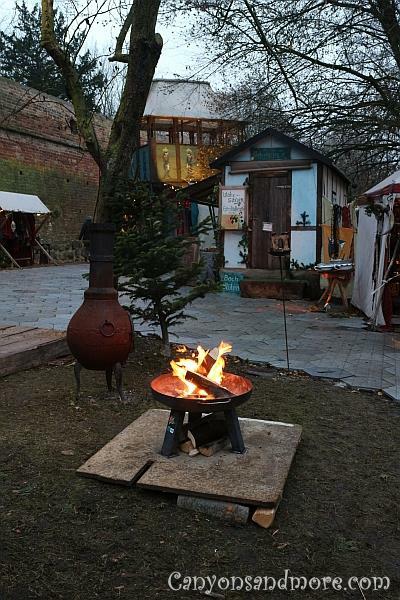 You can go inside it and enjoy a mulled wine with friends at a higher level while warming up from the cold winter temperatures. 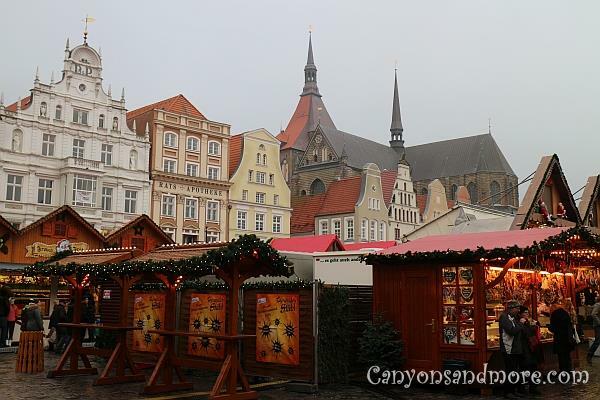 This is the view when heading from the main market area back towards the pedestrian zone. This is one of the medieval looking stalls you will see at the historical market. At the opposite end of the pedestrian street “Kröpeliner Strasse” is the “Kröpeliner Tor” or Kröpeliner Gate. This view is what you see when you go beyond the gate into yet another market area. When you look back you can see how lovely the gate has been lit for the holidays. Another smaller pyramid is located in the center of the pedestrian zone of the city. At night the lighting changes colors, which reflect off of the surrounding buildings. This lovely wooden pyramid is located beyond the Kröpeliner Gate.